In type 2 diabetes mellitus (DM2) plasma levels of non-esterified fatty acids (NEFA) are increased. Changes in plasma levels of NEFA are associated with changes in myocardial triglyceride (TG) content and with changes in myocardial function in healthy subjects. Whether this flexibility of myocardial TG can also be induced in DM2 is yet unknown. To determine in uncomplicated DM2 whether different levels of plasma NEFA induce changes in myocardial TG content and myocardial function. Myocardial TG content and left ventricular (LV) function were determined using proton magnetic resonance spectroscopy and MRI respectively at 1.5 T (Gyroscan ACS/NT15, Philips) in 9 subjects with uncomplicated DM2 (mean age ± SE: 58.9 ± 1.6 yrs, BMI 26.4 ± 1.0 kg/m2, HbA1c: 6.0 ± 0.2%) before and after 3 days of a very low calorie diet (VLCD, 473 kcal/day, to increase plasma levels of NEFA) and after 3 days of a VLCD complemented with the administration of acipimox (4 × 250 mg during the last day of caloric restriction, to decrease plasma levels of NEFA). The percentage (%) of myocardial TG was calculated as TG/water × 100. Myocardial function was calculated as ejection fraction (EF) for systolic function, and the ratio between early and atrial filling phase (E/A ratio) for diastolic function. Plasma NEFA significantly increased after the VLCD (from 0.51 ± 0.08 to 0.91 ± 0.15 mmol/l, P < 0.05), whereas plasma NEFA were significantly decreased after acipimox administration (0.24 ± 0.05 mmol/l, P < 0.05, Figure 1A). Myocardial %TG at baseline was 0.66 ± 0.11% and increased to 0.93 ± 0.18% after the VLCD (P < 0.05) which was reversed after the acipimox (0.81 ± 0.19%, P = 0.17 vs. baseline, Figure 1B). LV EF did not change after both interventions compared to baseline. However, diastolic E/A ratio was significantly decreased after the VLCD (from 1.02 ± 0.17 at baseline to 0.91 ± 0.21 after the VLCD, P < 0.01) but remained unchanged after acipimox (0.96 ± 0.24, Figure 1C). Changes in plasma NEFA (A) and changes in myocardial TG content (B). Diastolic E/A ratio is decreased after the VLCD, but unchanged after acipimox administration (C). NEFA = non-esterified fatty acids, TG = triglyceride, VLCD = very low calorie diet, E = early, A = atrial. * P < 0.05. A short-term VLCD induces myocardial TG accumulation in patients with uncomplicated DM2, and is associated with changes in diastolic function. 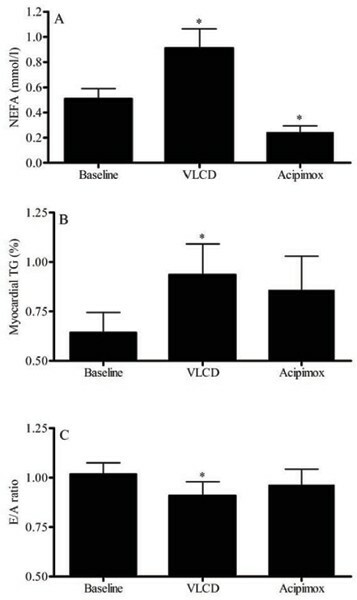 Administration of acipimox during the VLCD reduced myocardial TG accumulation together with plasma levels of NEFA and showed no effects on diastolic heart function. These data stress the relevance of elevated levels of NEFA in DM2.